Both ENZO and Strymon’s BigSky reverberator accept MIDI commands and, because of their many presets and deep controls, a MIDI controller was in order. The MC6 MkII MIDI controller is excellent and allows easy access to all 16 ENZO factory presets as well as programming additional presets using CC commands. Now both BigSky and ENZO can be comfortably located at the back of the pedalboard and controlled with the MC6 MkII located at the front. In the image above, the display of the MC6 MkII shows a few presets in Bank #1 controlling different reverb machines in the BigSky. Installation of MIDI in the board required a MIDI I/O adaptor for ENZO sold by Meris, and a MIDI merger (from Kenton) to merge the outputs of the MC6 and the USB/MIDI adaptor (from Roland) to send and receive MIDI from a computer. All these had to be secured underneath the board. Finally, the EXPRESSIONATOR from Mision Engineering is an expression pedal controller that allows one single pedal to control the expression of three different pedals. Our trusty Volume X MiniPedal (from Dunlop) was already doubling as volume and expression pedal. 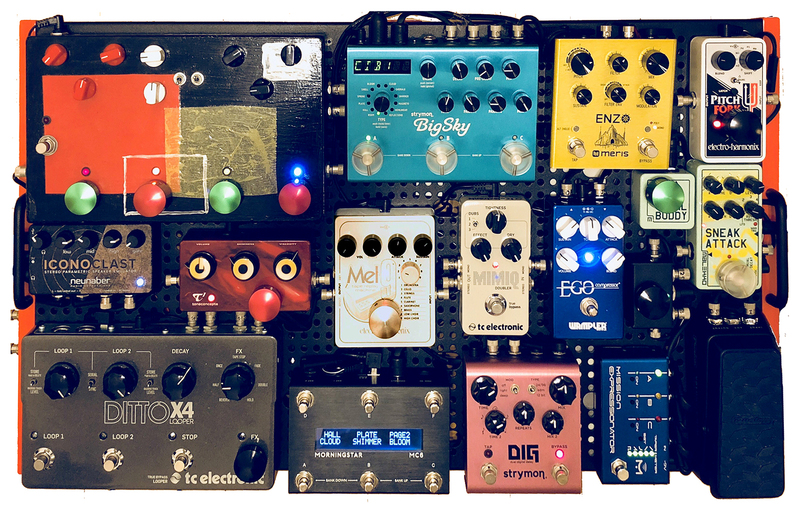 Now it can alternatively control expression in the ENZO and BigSky (via the MC6 MKII), Strymon’s DIG double delay, and ElectroHarmonix’s PitchFork pitch polyphonic shifter, by pressing the footswitch. Cool!